Encaustic painting is very old technique known as being highly permanent, thanks to its beeswax binder – heated until molten and then mixed with dry pigments in order to make paint. In the very end, the whole surface is being reheated to fuse the layers, bonding them to the support. This is called burning-in, thence the name encaustic. 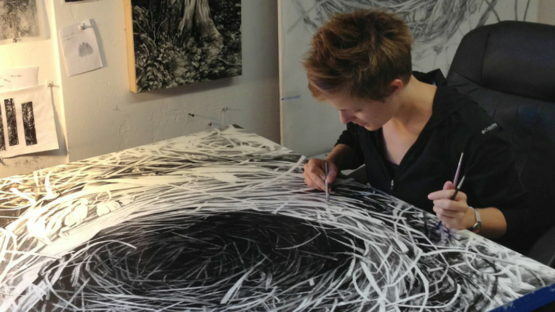 An American artist Robin Cole Smith is known for approaching this ancient technique a bit differently – she actually creates her work by layering the drawing transmitted onto the wax and suspended at intervals between layers of beeswax. Plus, there is no paper involved in the final product! Robin Cole Smith was born in 1985, in Denver, Colorado. She received her BA in English at Colorado College with a prestigious Boettcher Foundation scholarship. During her schooling, Smith also studied in France and Ireland, returning to Burren College of Art, in Ballyvaughan for the post-baccalaureate program in studio art. Robin Cole obtained her MFA at the Laguna College of Art and Design. Smith is mostly inspired by her native Colorado and its landscapes. Her hyper-realistic paintings and drawings carry this artist’s memories of the trees, rocks, herbs and even bird nests she is so used to see in Denver and its surrounding. Cole especially focuses on small details, like a plant bark, rippling water, or falling leaves – highlighting their unique forms and textures and transforming thus the natural scenery into something that comes very close to the portraying. By using a monochrome palette, this artist underlines the immortal essence of nature, not losing sight of its fragility, thanks to the intimate and intuitive characteristics of the black and white medium. In 2012, Smith received the Elizabeth Greenshields Foundation artist grant in support of her unique encaustic work. She currently teaches at Laguna College of Art and Design and Irvine Valley College. 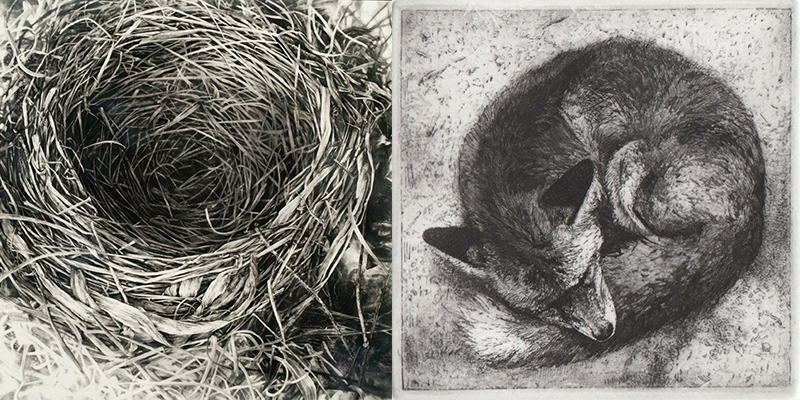 As Robin Cole prompted in her artistic statement, her work is always balancing on the line of different boundaries: visual, metaphorical, natural, and spiritual. Fascinated by both light and dark, known and unknown, seen and unseen – Smith often oscillates between familiar impulses and inexplicable presences. Her exploration uses the elements of science methods, combined with those of the spirit that go beyond the visible. This artist is represented by Gallery 1261 in Denver, CO.
Robin Cole Smith lives in Colorado.